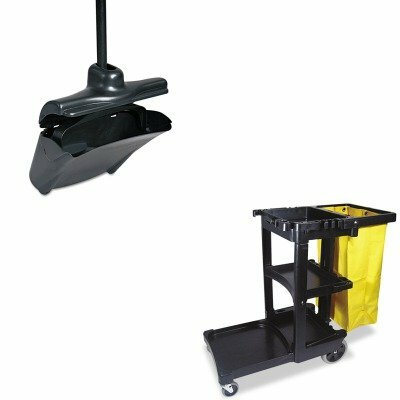 lt;stronggt;RCP253200BLAlt;/stronggt;lt;BR/gt;Rubbermaid-Black Lobby Pro Upright Dust Pan With Self Opening/Closing Coverlt;BR/gt;Self-opening/closing cover. Built-in recess on the back of the pan allows emptying without touching the pan bottom. Yoke and handle assembly features larger, quieter hinge pins. Wheels and wear pads on the back of the pan provide long product life. Lightweight construction reduces the risk of back strain. Lobby broom sold separately. Materials: Plastic/Metal Width: 12 1/2amp;quot; Colors: Black.lt;BR/gt;lt;BR/gt;lt;stronggt;RCP617388BKlt;/stronggt;lt;BR/gt;Rubbermaid-Black Lobby Pro Upright Dust Pan With Self Opening/Closing Coverlt;BR/gt;25-gallon vinyl bag attaches to handle. Three shelves for supplies hooks for mops and brooms. Platform holds standard size bucket supplies not incl.. Color: Black Caster/Glide/Wheel: Four Casters.